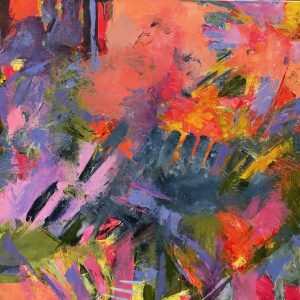 Artist reception May 25th, 3:30 – 5 pm, accompanied by a reading by Vermont Poet Laureate Chard deNiord. Free and open to the public. A fifth season suggests an extra cycle of seasonal time. All the particulars of a regular season are present, a slant of light, shadows and the space between them, weather, and ordinary, daily events of living. In this new season one sees differently in a similar but unexpected place. Painting after a life threatening illness grounded and inspired me to continue creating in a reframed and altered territory. This collection of paintings ranges from recent abstract, to self portraits drawn during chemotherapy. The paintings are mostly abstract on wood or canvas in thick acrylic.